While many flock to see China’s famous man-made wonders, so many of its most guarded treasures have been provided by Mother Nature. 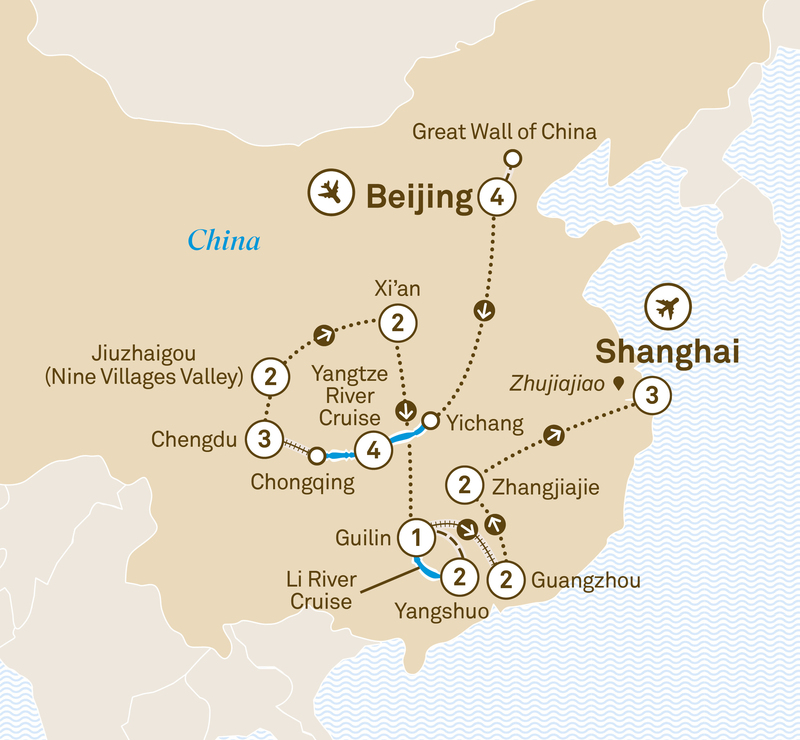 This energetic itinerary celebrates the natural China, sometimes overlooked in explorations of this vital and fascinating region. Discover the wondrous landscapes of Sichuan, Guangxi and Hunan provinces, from glorious waterfalls and mystic lakes to soaring peaks and dense woodlands. Marvel at vast areas of natural beauty and discover unique spots you won’t encounter elsewhere, such as the towering quartzite sandstone features near Zhangjiajie, or the lakes of Jiuzhaigou, with their startling shades and hues. This journey is perfect for guests looking for a little more adventure, with plenty of opportunities to get out and actively explore these natural gems on foot. Whether you’re looking to capture all this beauty on camera, or simply in your memories, you can look forward to spectacular images and impressions that have a magic only nature can conjure. Begin your discovery of China with a Peking duck welcome dinner. Your home for the next four nights is located close to the Forbidden City. Wander through Tiananmen Square and enter the Forbidden City. Enjoy lunch with a local family in a traditional home in the hutongs before relaxing on a rickshaw ride through the ancient laneways. Try Asian at Lost Heaven, or Western dishes at The Exchange. Take an interactive cooking class or visit the 15th century Temple of Heaven. Alternatively, learn the ancient art of writing Chinese calligraphy. The afternoon is at leisure to shop at the Silk Markets. Experience an unforgettable evening at either the famed Peking Opera or the spectacular Kung Fu Show. Explore the Summer Palace and enjoy a cruise on Kunming Lake. Fly to Yichang to join your boutique cruise ship, Yangzi Explorer. Visit the Three Gorges Dam project site. Later, sail through Xiling Gorge whilst sampling afternoon tea. Tonight, enjoy the Captain’s reception. Explore the dramatic gorges of Shennong Stream. Later, traverse Wu Gorge, known for its sheer rock walls, and Qutang Gorge, the most dramatic of the gorges. Enjoy an insightful excursion to Fuling to see the 816 Underground Project. Tonight, mingle at the Taste of China gala dinner in your finest Chinese outfit. Disembark and explore the ancient town of Ciqikou. Travel by high speed train to Chengdu, before settling in for a three night stay. Discover the Museum of Sichuan Cuisine before an interactive cooking class to learn all about the secrets of this style of Chinese cooking. Dinner is a choice of Sichuan cuisine, Western ribs and burgers at Mooney’s Irish Bar, or an international buffet dinner. Enjoy an enchanting close encounter with rare giant panda cubs. Later wander along Jinli Street to the second century Wuhou Temple. Fly to the World Heritage-listed Jiuzhaigou Valley, known as Nine Villages Valley. En route, explore Muni Valley before relaxing at your resort for two nights. Choose to dine at Shunxing Chinese restaurant or an international buffet at Nongra Café. At 2,800 metres explore this remarkable World Biosphere Reserve by private bus. Discover Songpan Ancient Town then fly to Xi’an for a two night stay. Explore Xi’an’s ancient city wall and the Muslim Quarter’s alleyways before flying to Guilin for an overnight stay. Enjoy picturesque vistas as you sail down the idyllic Li River to Yangshuo. Later stroll around the Old Town before settling back at your luxurious accommodation for a two night Special Stay. Venture into the countryside to discover a rural way of life rarely encountered by tourists. Visit Fuli, the hometown of China’s iconic painted paper fans. This evening, witness the amazing Impression Liu Sanjie Show. After exploring around Guilin, take the high-speed train to Guangzhou for a two night stay. Visit the historical Yuexiu Park and Shamian Island or visit Sun Yat-sen Memorial Hall. Alternatively, ride the Bubble Tram on top of Canton Tower. Your afternoon is at leisure for shopping. This evening admire the city’s futuristic skyline on your cruise along the Pearl River. Fly to the World Heritage-listed Wulingyuan Scenic Area in Zhangjiajie for a two night stay. Tonight, experience a cultural performance at the Zhangjiajie Theatre. By private shuttle bus, explore this region’s wondrous ravines and gorges. Avoid the queues with your VIP pass and ride the Bailong elevator at Yuanjiajie. See the gravity-defying mesas of Avatar’s ‘Hallelujah Mountain’, then soak in the views from Tianzi Mountain. Soar on the world’s longest cable car to Tianmen Mountain, also known as Heaven Gate Mountain. This evening, fly to cosmopolitan Shanghai and enjoy a three night Special Stay. Stroll along the famous Bund and compare its striking heritage buildings to those in Yu Gardens. Across the Huangpu River, explore the Pudong area and discover the modern China. Later, admire the view from Shanghai Tower. Wander through the Shanghai Museum, People’s Square and Xintiandi or visit Zhujiajiao. Alternatively, undertake take a cruise on Huangpu River. Later, explore at leisure, before your farewell dinner. It’s the end of an amazing journey. From Chengdu to Shanghai, witness the natural wonders of China over 17 days in 5 star luxury. Highlights include Yangshuo, Guilin, Guangzhou and Lijiang.